2 Inches Low @ 20? What do you think - Should we deliberately sight 2" low? Every time I hear about an unrecovered deer I always assume a high hit. Either high lungs, high in the shoulder blade, or high in the back (what some hunters call 'the Void'). My assumption is correct – 80% of the time. There’s lots of reasons for high hits and for the record, I have had my share of them too. But what if I told you there was a way to dramatically reduce high hits? And all it takes is an Allen wrench? In 2007 I hit a big buck in Connecticut that had a 24” spread – a giant for the nutmeg state. The hit looked good to the naked eye but the video camera showed that it was, in fact too high. The buck reacted to the sound of my release and the first seconds of his flight response was to drop 3” before my arrow struck him. I ended up killing that buck two years later. This reaction happens so fast that most Bowhunters are unable to notice the deer’s vitals are 2-4” lower by the time the arrow reaches them. And this isn’t an isolated incident. I went back and reviewed the last 30 kills I filmed. In all but 6 the vitals were lowered an estimated average of 2” when the arrow struck. The video camera does not lie. Last year I assisted a fellow Bowhunter on a blood trail. He had hit the deer ‘perfect’ and headed back to the lodge before heading out. We asked him about the hit – and the deer’s’ reaction. From the description it was going to be a simple recovery. The blood trail was decent for the first 50 yards, but then it got harder. The hunter was 100% confident, but I wasn’t. As we hit the 100 yard mark I knew we were following a high hit. The deer was never recovered. I keep records of my deer kills. I have shot and recovered over 300 whitetails since 1977. My recovery rate since 2004 (when I switched from Stick bow to Compound) is 87%. However, during the last 9 years my recovery rate improved to a respectable 96%. One reason for this improvement? I have been deliberately sighting 2” low at 20 since 2008. This deer is completely unaware at the time of the shot, we estimate that the deer drops 2.5" at 15 yards - as the arrow enters chest then continues another 2.5" down after pass-thru. This takes place in .04 seconds according to the video. There are three main reasons we hit deer high (percentage is my guess). I don’t care what anyone says. Most deer react to the sound of shot. Alarmed deer react more than calm deer, but even a calm deer automatically compress their legs to spring at any loud sudden sound. That sound can be an apple hitting the ground or the sound of an arrow being released. Some guys call it ducking the arrow. That is silly, it is nothing more than an automatic flight response hard-wired into every whitetail deer. When you add together a nervous hunter with a nervous deer strange things happen. Despite all the shooting practice on a new 3-D target a lot of hunters put that 20 yard pin right in the middle of the deer’s chest. I have too. It’s human nature to lose some wits when adrenaline is surging and you are under pressure. The final, and least likely reason is that many hunters just guess wrong. They put their 20 yard pin on a 17 yard deer. Today’s compounds make these small range errors less critical but they can contribute to high hits. 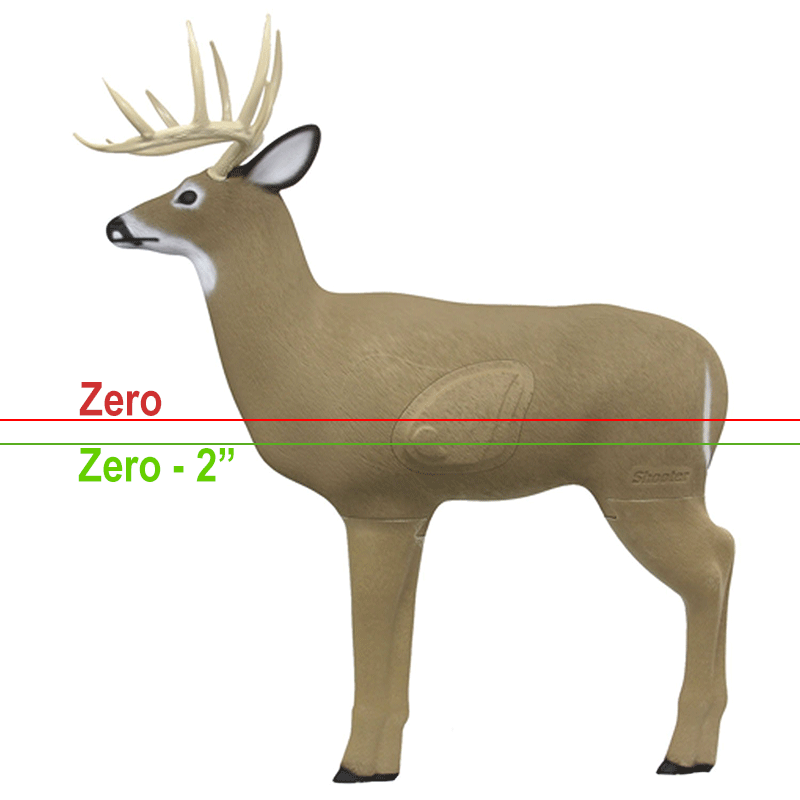 For whitetails, range estimation is less a factor than mule deer or other animals shot at typically longer distances. Adjust the sight? or adjust the aim? A lot of guys, especially hunters who participate in 3D or target shoots simply refuse to deliberately sight in low. I get it. They claim to adjust - mentally - by manually aiming low. They want to be in control of the shot and don’t like the idea of their pins being anything but zeroed. That is understandable, but I know from experience that in the fog of the moment a lot of guys fail to compensate. So I like taking that manual adjustment out of the equation. I’m not here to argue my technique over anyone else’s, I’m just throwing out what has worked for me – but I also proved it on others – let me explain. I have two boys who love bowhunting. When they turned 9 we took them to the famous Shiloh Ranch in Oklahoma for their first big game kills. The boys practiced every day for weeks and both were shooting great. What they didn’t know was on the day of the hunt I changed their sights to hit 3 inches low. Guess what? Both boys double lunged their hogs - hitting both lungs slightly higher than the vertical mid-point. Had I not sighted them 3” low, it’s likely both of their first shots on a big game animal would have been a negative experience. When my son Matt turned 14 he got his first whitetail. A perfect hit on a deer that went 20 yards before tipping over. Once again, I had sighted his bow 3 inches low. Now before you cite child abuse I had nothing but my kids’ best interest at heart and it worked – because I knew it would work. They both killed their whitetails and we enjoyed a great moment that made all of us proud. Now that they’re older they follow that practice themselves. One of the arguments I hear from guys who disagree with this tactic is; “what happens if the deer does not react?” It does happen, but it’s the exception not the rule. In fact, in reviewing my last 30 filmed shots it’s only happened in 15% of the cases. I appreciate the concern. It is counterintuitive to any thinking person. But for argument sakes let’s accept the premise that the deer does not react? Here’s what will happen. I generally aim for the lower third of a deer’s chest. If no reaction occurs I hit low heart. Even if the heart is missed - and I clip the deer low chest – the hit produces more blood on the ground than a high chest hit. It’s simple physics. So I take that risk. I start with the bow, arrow, and broadhead combination that I will be using during the season. I number every arrow and make sure every arrow flies perfectly. Once those combinations are confirmed I begin the process of sighting in my deer rig. On my deer rig I use a Montana Black Gold sight with 20-30-40 yard pins. I then shoot that rig until I am confident that I all three pins are zeroed. I go back to the 20 yard mark and adjust the entire Black Gold sight housing UP until I am hitting exactly 2” LOW at 20 yards. There is no need to adjust individual pins, I move the entire housing which adjusts the 30 and 40 pins as well. I never practice with field points and I never change this combination unless I have to switch bows - or I hunt something other than deer. Now, I have mentioned that I sighted my kids’ bows at 3” low, yet my bow is sighted 2” low. There are two reasons for the difference. The first is because I have more confidence in my ability to hold it together. I’m far more experienced than my kids having shot over 300 whitetails (including some real giants). The second is I am generally using a faster bow with a lighter arrow than they are. I have found that 2” low is almost foolproof – even if the deer is deaf! While I believe most deer drop more than 2” within 20 yards, this subtle change works very well while minimizing the risk of shooting too low. How about Elk and other Big Game? This technique is focused on deer. But I get asked about other big game animals like Elk, Moose, Goats? While I have lots of proof that these animals react to shot noise too, the big animals are slower and drop less than deer – so I only adjust for deer. I could make an argument for adjusting on Pronghorns, Mule Deer, or smaller antelope in Africa but I just try to aim low. It’s really a personal choice. In addition to the deer videos I reviewed I also looked at some of my big game kills. This included elk, cape buffalo, moose, caribou, and plains game. The review showed little reaction on all but elk. I saw a dramatic reaction by both my elk kills however the lungs have a lot more room for error so I keep my big game rig zeroed. I know some guys will become unglued with the idea of deliberately sighting lower than your zero. And I’m not suggesting that it’s right for everyone. But I contend that if more Bowhunters followed this practice there would be less shoulder blade hits, less “void” hits, and more chance of finding a low chest hit than a high chest hit. At the outset of this article I mentioned that I keep records of all my shots. So I’ll leave you with this fact. Since 2008 I have been deliberately zeroing my sight 2” low. In nine seasons and 63 deer shot I have not experienced a single shoulder blade hit nor a single - so-called “void” hit. And my recovery rate on whitetails since 2008 is over 96%.